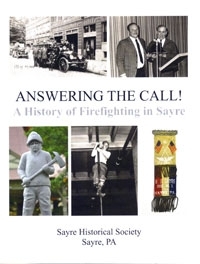 A 28-page soft-cover booklet detailing the history of firefighting in Sayre based on the 2017 exhibit at the Sayre Historical Society. The book includes rare images from the collection of James Nobles and the Sayre Fire Department, a list of major fires in the borough's history, color images of historic Firemen's Convention ribbons, and an image of the 2009 Firefighter's Monument in Howard Elmer Park. Price - $9.43 plus .57 tax ...Total $10 plus $5 shipping and handling.